Loving omnibus films is a lot like having a gambling problem: you know you're probably not going to luck out, but you watch "Southbound" and the recent "V/H/S" films anyway because you must play the odds, knowing that the only way to ditch your particular habit is to lose everything on a really bad hand. 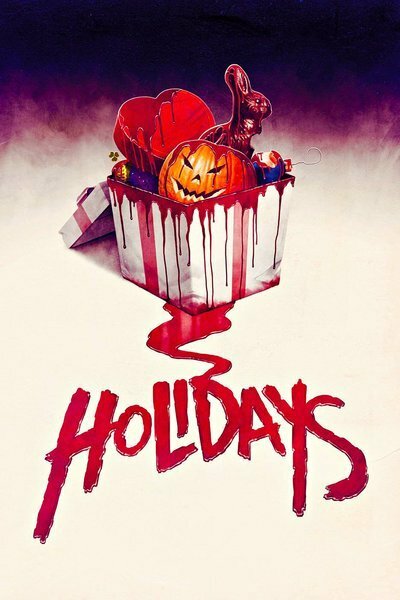 "Holidays," a campy holiday-themed portmanteau film by several indie horror filmmakers, is not bad enough to dissuade prospective viewers' from their curiosity. In fact, the whole feather-light affair is practically redeemed by a single entry: writer/director Anthony Scott Burns' superbly spooky Father's Day segment, in which a young teenager re-unites with her missing father in an abandoned beach-side suburb. Still, "Holidays" is frustrating because its creators all have something good going for them, but almost consistently have no ideas of what to do. You can always skip forward to another segment next if you're bored and have rented "Holidays" on Video on Demand (a reality that many viewers of the film will likely face). But if you take a chance on this film, you'll soon realize that almost none of its entries are safe bets. The weakest entries are the ones that have their tongues-somewhat-in-cheek, but are too cool to crack good jokes. There's the Easter segment, written and directed by Nicholas McCarthy ("The Pact," "At the Devil's Door"), a predictable fairy tale about a little girl who is traumatized by the conflicting stories she's hearing about Jesus Christ and the Easter Bunny. The unnamed girl (Ava Acres) is soon visited by a disturbing half-naked Jesus bunny-man (Mark Steger), who encourages her to touch his stigmata. This scenario sounds a lot funnier than it is, I promise you. In reality, the creators of the Easter sequence joylessly lead you exactly where you expect them to, and rarely stop long enough to wink at you along the way. The same cannot be said of the equally underwhelming Valentine's Day entry, co-written and directed by Kevin Kolsch and Dennis Widmyer ("Starry Eyes"). Kolsch and Widmyer's tribute to "Carrie"—awkward pre-teen Maxine (Madeleine Coghlan) gets pushed over the edge by cartoonish bully Heidi (Savannah Kennick)—never stops poking viewers in the ribs, from over-acting child actors to lurid hot magenta lighting cues. It's a short film that's supposed to be funny in a macabre sort of way, but only winds up feeling like a giddy homage whose meaning and pleasures are strictly superficial. You'll never believe these characters exist outside of any given scene they're in. Kolsch and Widmyer slavishly emphasize kabuki-like make-up and fussily-composed medium close-ups to convey menace and dread. Kudos to their cinematographer and make-up artists, and shame on their casting director for emphasizing ginormous doll's eyes and sullen cheek bones over emotional range and expressiveness. We pause to point out that Kevin Smith ("Tusk," "Clerks") has an entry in "Holidays," but not even I will defend it. Save your breath, fellow apologists: his latest is flat-out unpleasant. There are a couple of half-baked entries that come very close to being recommendation-worthy, like newcomer Sarah Adina Smith's atmospheric pregnant-teenager-vs.-maternity-cult Mother's Day entry. This segment is conceptually flat, but directed with a commendable eye for moody atmospherics. There's also "Dracula Untold" director Gary Shore's poorly-realized, but conceptually noteworthy St. Patrick's Day sketch, in which an emotionally unstable pregnant woman gives birth to what one nurse hysterically dubs "Rosemary's Baby, but a snake." But really, if you watch "Holidays," let it be for the terrific Father's Day segment. This is the land of Edgar Allan Poe, a morbid world ruled by the memory of dead loved ones, and the encroaching knowledge that one day, you too will die. Carol's (Jocelyn Donaghue) reunion with her absent father is, in its way, romantic and sad. She learns that he's still alive after discovering a long lost cassette recording he made for her years ago. You don't just watch this short with the goal of to see what's in that house, what's in that room, what's around that bend. When you watch the Father's Day segment, you're led to want one thing—a mystery solved—and ultimately given another: an unexpected father/daughter romance. See "Holidays" if you must, but watch Burns's contribution first.